I was tagged in a post a few days before MCM Birmingham where a father was requesting cosplayers that were in attendance to send loving messages to his son that couldn’t attend the Con. Gideon had a brain tumor and recently had brain surgery and was in the hospital. This crushed me for a few reasons. First I was really considering not going to the Con because I was feeling not in the Con spirit. It made me re-evaluate how happy I should be because I could go to the Con and be among friends and other cosplayers. Second I hate to see stories like this. I reached out to Gideon’s father and asked if I could get Thor’s hammer to be signed by other cosplayers. He was thrilled with this and I put this plan in motion. I also thought it would be great to have Captain America’s shield but unfortunately couldn’t find one that would arrive in time. I reached out to many of my cosplay friends on Facebook and @crazyquinn_ offerred to donate a shield and it warmed my heart. We were able to get many cosplayers to sign both the shield and hammer and also to get videos of cosplayers telling Gideon to get well soon. 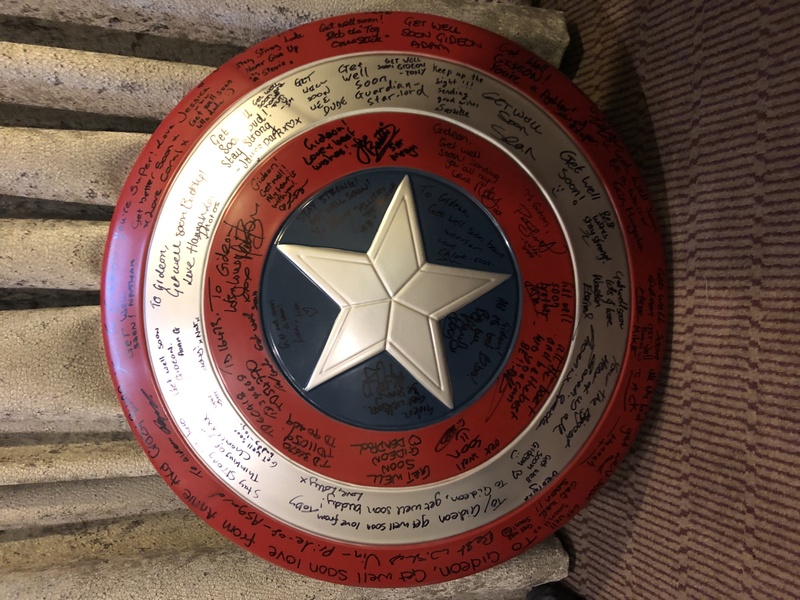 I have to send a huge shoutout to @crazyquinn__ for donating the shield and also helping to get many celebrities at the Con to sign it as well. Actor Mark Ryan not only agreed to sign the shield but also worked with MCM organisers to get other celebrity guest to sign the shield. I loved seeing the support from the cosplay community. Get well soon Gideon! We hope to catch you next time around in Birmingham.